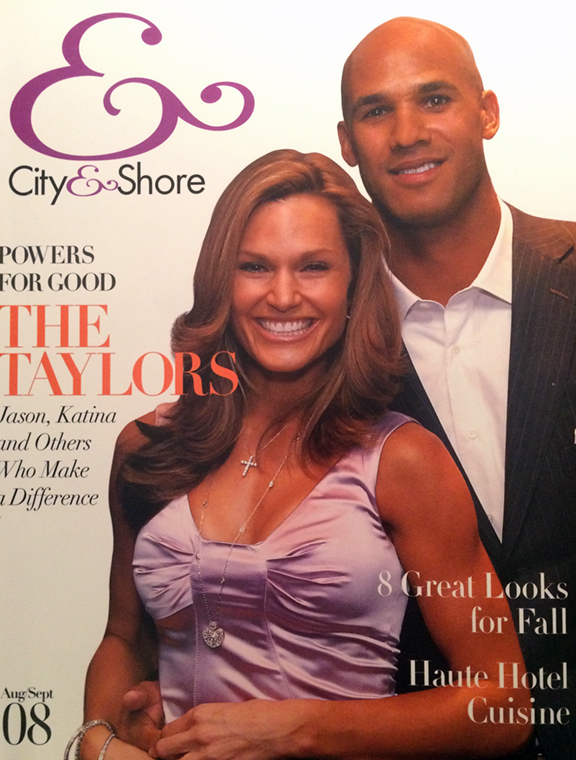 Editor’s note: On the edge of his induction Saturday into the Pro Football Hall of Fame, we offer a look back at our August/Sept 2008 cover story about Taylor and his wife, Katina’s, foundation and the work they did – and continue to do – in our community. They walked in barely able to read on a fourth-grade level, high-school players with worn-out sneakers and nowhere to go after school. Nine months later – after just a couple of hours a day, four days a week – the boys’ spelling, vocabulary and reading skills jumped two and three grade levels. Their grades improved, their FCAT scores climbed. And they discovered something more: a new swagger, healthier self-esteem and a celebrity role model who let them know they mattered. That’s the power of the Jason Taylor Reading Room, tucked inside the Miramar Youth Enrichment Center [and now a New Renaissance Middle School in Miramar, too]. That’s the mark the Miami Dolphins’ All-Pro defensive end hopes to make on a world that gave him a shot in life. That is Jason Taylor’s definition of success: using your celebrity to help the less fortunate, giving back, knowing the satisfaction of seeing a group of Miramar High hoopsters stand a bit taller in their own skin – and in those new Nike sneaks, donated with an assist from Taylor’s buddy, Michael Jordan. While the sports world speculates on how many years the Dolphins’ career sack leader has left on the football field, while Hollywood waits to see what the reigning NFL Man of the Year will do after Dancing With the Stars, while his fans debate how he’s been treated this season by a team whose jersey he’s worn his whole career, Jason Taylor is busy making a difference beyond sports stats and TV ratings. The man with the soft spot for disadvantaged kids is building a legacy one child at a time. It’s called the Jason Taylor Foundation. And, as with everything else Taylor has accomplished, he’s not tackling it alone. He has teamed up with his wife and together, after just four years, Jason and Katina have built what many in the non-profit world would call one of South Florida’s most effective charities. It is an organization that very much reflects the pair at the helm. What does that mouthful mean, exactly? For a boy raised by a single mother with lots of love but little money, it means giving about 260 disadvantaged kids an experience he never had, of going to a three-day football camp where current and former football stars offer lessons on passing, running a route and accepting constructive criticism. For the lanky kid with hand-me-down clothes who knew the lasting pain of being teased for pants that never fit, it means “Cool Gear for the School Year’’ – $300 Old Navy gift cards going to 50 or 60 impoverished kids. For the 1997 third-round draft pick out of the University of Akron, forever grateful for the opportunity the Dolphins gave him, it means partnering with the Take Stock in Children charity group to dole out seven years of mentoring and college scholarships to deserving sixth-graders. For the football star with a shine for Hollywood, it means “Big Screens – Big Dreams,’’ with Taylor escorting kids to private screenings of unreleased films like The Great Debaters, and bringing a few of the actors along to discuss the movie. For the small-town Texas girl, the former model and TV reporter who excelled at cheerleading, gymnastics and formal dance training, it means “Camp Katina – Cartwheels to Character,’’ a three-day summer program dedicated to nurturing young girls. For two parents who recognize the good fortune of having three healthy children, it’s the Jason Taylor Learning Center, so named after the $150,000 raised at the First Annual Jason Taylor Celebrity Golf Classic in 2004 went toward new computers, paint, wireless equipment and other upgrades at the Holtz Children’s Hospital recreational and educational center in Miami. And for the couple who know the value of a good education, it means making the Jason Taylor Reading Room the heart and soul of the operation, a place where struggling students come for intensive instruction in reading, language arts, spelling, writing and vocabulary and weekly life-skills lessons on teen alcoholism, violence, respect for others, building self-esteem and etiquette. It is a widely varied enterprise made possible with more than $2 million raised so far, thanks in part to partners like the Office Depot Foundation. Since partnering with the Taylors last year, the foundation has contributed more than $50,000 along with computers, backpacks and school supplies. Wong recalls a recent Taylor event where one boy told the audience how he was given a choice: gang life or the Jason Taylor Reading Room. He chose reading. “I don’t even know if you can put a dollar amount on that,’’ Wong says. And then there are the shouts of “thank the Lord’’ that spill from the crowd when the Urban League of Greater Miami announces the names of the lucky kids selected to receive “Cool Gear for the School Year’’ gift cards. For the kids, it’s the joy not just in getting new clothes, but in no longer having to worry about what they look like, so they can focus on what’s really important: learning. It’s a simple idea that goes a long way, and that’s the brilliance of the Taylors’ foundation. Those who work with the Taylors say it’s not only their compassion and ingenuity but also their authenticity that makes the couple philanthropic role models. The football star agrees on that point. Linda Sweet, who runs the Reading Room, sees firsthand how hard both Taylors work to follow through on those words. 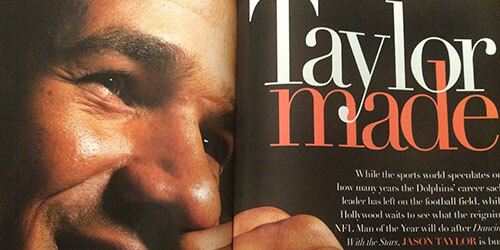 So as tough as this off-season has been for Taylor, as his football career begins to wind down, don’t worry about him. He’s already doing what he loves – he’s making a difference, and for the first time in a long time, he’s on a winning team. For information about the Jason Taylor Foundation – including the Jason Taylor Reading Room – visit http://jasontaylorfoundation.com/, call 954-424-0799 or e-mail info@jasontaylorfoundation.com. 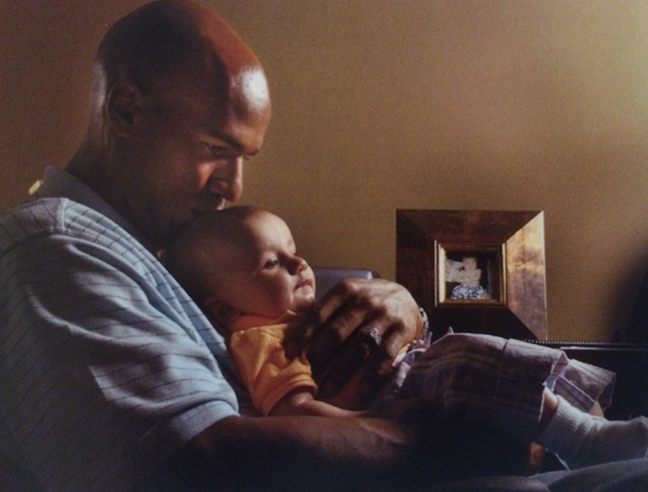 Photo by Judy Sloan Reich: Jason Taylor with his son Mason Paul in 2008 at the offices of the then newly created Jason Taylor Foundation.